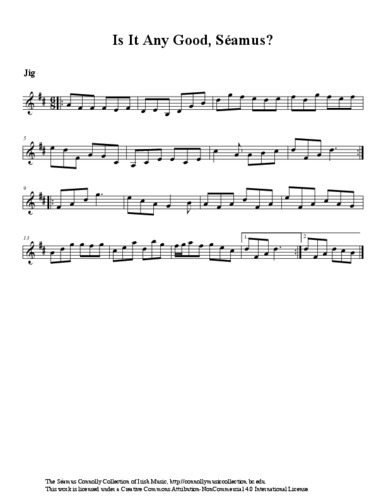 Fiddle player, accordionist, and composer Eddie Kelly played this tune for me and asked, 'Is it any good, Séamus?' I recorded Eddie playing it in a session on the street at an All-Ireland Fleadh Cheoil around 1990. The title somehow suggests that it is a composition of Eddie Kelly, but I'm not certain. I am honoured to have Manus McGuire associated with this collection, and here he gives us his interpretation of this grand jig. McGuire, Manus (fiddle), “Is It Any Good, Séamus?,” The Séamus Connolly Collection of Irish Music, accessed April 20, 2019, https://connollymusiccollection.bc.edu/document/456.